Class 4 Shingles were actually tested by dropping a steel ball onto the shingles. The UL 2218 impact test was developed in conjunction with insurance industry leaders for the highest rating. Would your current roof’s shingles survive the impact? 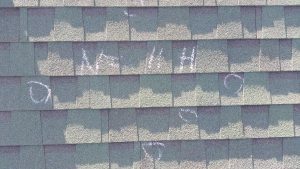 Therefore unless you already have Class 4 impact resistance shingles installed on your home, then the answer is no, they probably wouldn’t because most standard shingles on roof tops can’t survive an extreme hail storm. Most importantly, shingles would have damage on both sides of the shingle from such an impact. If you are ready for a new roof or re-roof, consider investing in the Class 4 Shingles. Your roof will last years more and withstand extreme weather or hail storm. Because these shingles weather the storm with the added impact resistance, these shingles offer a level of added protection that you will want for the life of your roof. These impact-resistant beautiful shingles have been specially engineered to face some of the worst storms and extreme weather and still look their best. They come in a variety of colors and styles so you will be able to find the right shingles that will showcase your home. 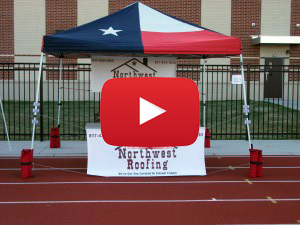 Don Rutherford, Founder and Roofing Contractor for Northwest Roofing, located in Haslet, TX. Don has 25+ years of roofing experience. He holds an A+ Business rating with the Tarrant County Better Business Bureau. Take a look at the Gallery of Homes that we serviced and read our satisfied customer Testimonials. Be sure to use our easy Contact Us form to let us know how we can help you with roof leaks or other services. We are looking forward to helping you.